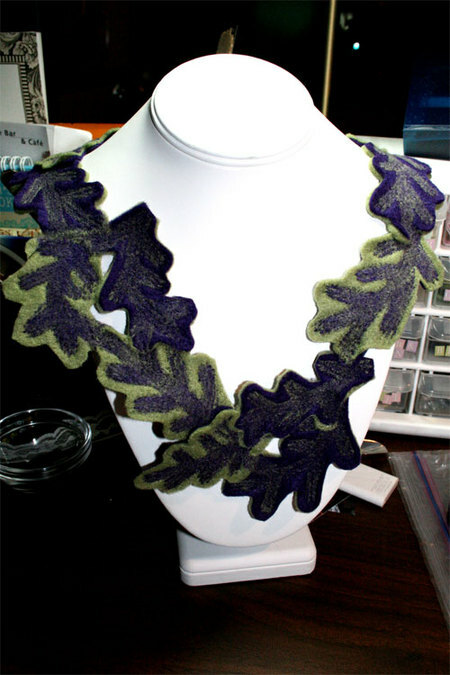 I wrote this article for Craft Critique, where it appeared two weeks ago. It’s a wonderful treat to come home from a vacation with a nearly completed scrapbook. I recently attended The Bead & Button Show in Milwaukee and thought I’d share a few “how-to’s” on creating your own travel art journal. 1. Will I be working on my journal in a single location (ex. 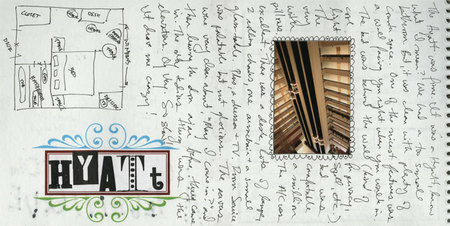 always at the hotel) or will I be working on my journal in various locations (ex. on a bus, in a park, at lunch)? If it’s the latter, you’ll want something small and portable with a sturdy back so you can work without a table. If it’s the former, you can go with any size or format you feel comfortable with. 2. Do I want to include full sized ephemera? If you do want to include all those maps, brochures, postcards, etc. 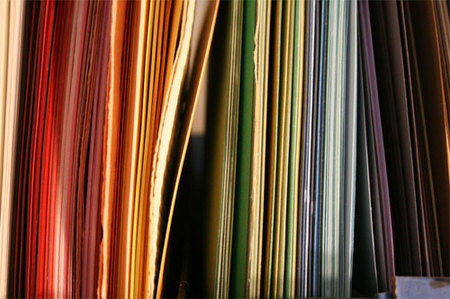 that you gather on your trip, you need to choose a journal that can accommodate the size of those items. Consider a journal that you can attach a legal sized envelope to. This way it’s still portable, but you can fold up any larger ephemera and place it into the envelope. 3. What media will I be using? 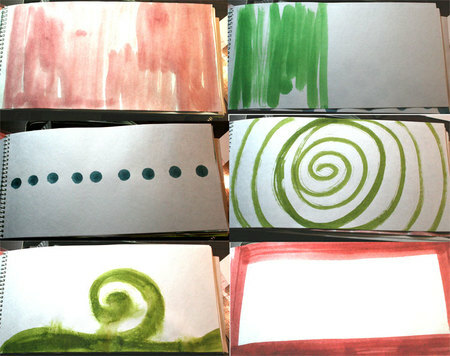 If you’re going to be painting in your journal, you need a heavier weight of paper. There are many beautiful watercolor journals and pads out there. If you’re just going to be writing and drawing, you can go with a much lighter paper. 4. Will I be gluing in a lot of photos, found objects or other ephemera? • A spiral binding will give you some wiggle room when your book begins to expand (though it may get crushed in your suitcase or bag). • A binder type book is also very sturdy, but can be bulky. One of the advantages to this type of book is that you can slip ephemera into page protectors as you go. • You can always make your own book too. This way you get the type of paper, the size, and the binding that works for you. For my trip, I chose a 6x12 spiral bound landscape sketchbook from the art store. Even though I was planning on doing some painting, I just couldn’t say no to the cool 6x12 size! Whew. That's a lot to fit into a tiny traveling tin! My tin is one that cookies came in and is 9x6.5 inches. What I really want is a lunch pail style tin, but they're either too big or too small. I want the handle and the ability to put things in vertically! Until I find the perfect one, I'll keep playing Goldilocks. In retrospect, I wish that I hadn’t brought the tiny acrylic alphabet. I would have preferred a tiny wood mounted alphabet. Even though it would have taken up more room, it would have been more user friendly in this environment. Those tiny stamps get lost so easily and are hard to keep clean on the move. I wish that I had brought a pencil sharpener (for the watercolor pencils) and a tiny stapler (to keep the rub ons together). This is an easy, easy step to ignore. But, in the long run, it makes your life so much better to do it! For me, I like my books to have some color. But, painting backgrounds can be a tedious process on the road. It takes a long time for stuff to dry. You have to have paints or dyes with you, etc. My simple solution is to pre-paint three-quarters of the book. I like to leave some pages blank because I find it pleasing to have occasional white pages. I pre-painted my book with Walnut Ink TintZ from FiberScraps. I didn’t think about anything specific or worry too much about it. I simply poured on the color and let it dry. Huh? What does this mean? Didn’t we just prepare the journal? Yes, you prepared the book, but not the daily pages. One of the secrets to creating satisfying pages is to prepare them each night. What do I mean by that? Well, it’s easier to show you. • I applied a rub on quote to the top of the page (“Follow Your Bliss”). • I wrote the name of the class on a label sticker and adhered it. • I created a pocket out of scrap paper, stamped two label images on it, applied the blue and red rub ons to it, and stuck several tags in the pocket. This left me free to take notes, etc. in class and not worry about neatness or artistic value because the format was already there. I know what you’re thinking. Why can’t you just do that at home? Why do you have to do it the night before? Well, you never know how much room (i.e. how many pages) a particular event is going to take up. You also don’t know when you’re going to want to do a drawing or glue in a brochure, so I find it easiest to prepare your pages the night before based on the next day’s agenda. For example, if you were in Paris and planning on going to the Eiffel Tower, you could save that fabulous laser cut Eiffel Tower sticker for the page about the Eiffel Tower instead of simply having it randomly in your book. Another good preparation trick is to create titles on scrap paper. That’s what I did with “Fine Feathered Friend” below. I created the title block on scrap paper and carried it in my bag because I wasn’t sure how much room the previous event was going to take up. Once I was ready, I simply adhered the title and voila, a prepared page. It’s impractical to take your entire kit with you if you’re working on it all over the place. I like to just take the journal, a pen, a pencil, scissors and some adhesive. 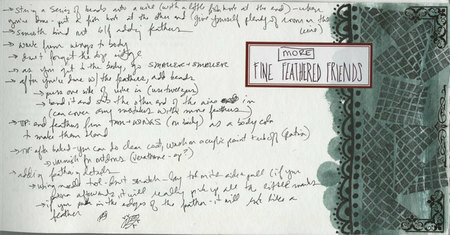 With a prepared page, this means that I can just scribble stuff down or glue it in and not worry a lick about design. It’s already laid out for me. However, there is still some finishing work to be done. In the example above, you can see that I pre-painted the page, but I didn’t do much else. 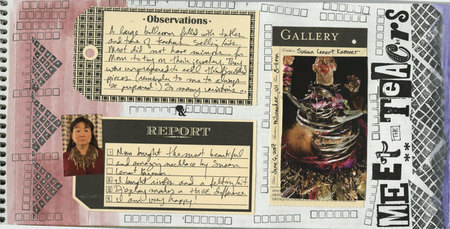 As the title says, “More Fine Feathered Friends,” this is a continuation of the previous page. I hadn’t planned on having more than one page the night before. So, I took my notes on the left side of the page. 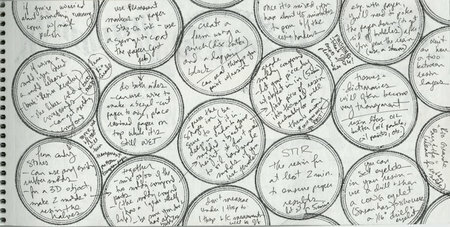 When I got back to my hotel room that night, I added the label title, doodled the border, stamped to fill the space, and added rub on designs. An easy finish to this page. Sometimes there’s no finish work, as in “Talisman Bracelet” below. This is strictly a personal taste issue. You can embellish your cover. Or not. You can print all the photos you took and add them into your book. I only created pages on the right side of my album, so all the left (or backside) pages were available for photos. Or not. You can do a “wrap up” page at the end of the book where you analyze the trip or list favorites. Or not. You can go back into your book and embellish. Or not. You can add new pages that you never got to. I added a general description of the hotel we stayed in (below). Or not. 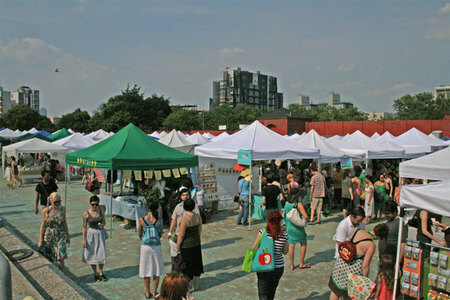 Last weekend, I attended the Renegade Craft Fair in Williamsburg. What follows is my review, originally posted on Craft Critique. Well, today I hopped on the L train and headed out to Williamsburg (a hipster neighborhood in Brooklyn) to check it out for myself. The craft fair was situated in an empty pool. A very funky location! (Though given the unrelenting sun and heat, I did wish that the pool were full of water.) Alternative rock played over several loudspeakers, an ice cream truck sold soft serve to dozens of sweaty customers, and a vendor sold tofu dogs and other vegan appropriate food off of a grill. My cousin and I jumped (literally, we had to in order to get in) into the deep end of the pool and started looking. Color was everywhere. The line between vendor and customer was thin: both wore thrift store chic, piercing and tattoos abounded, most were in their twenties and thirties, and nobody was afraid of color. 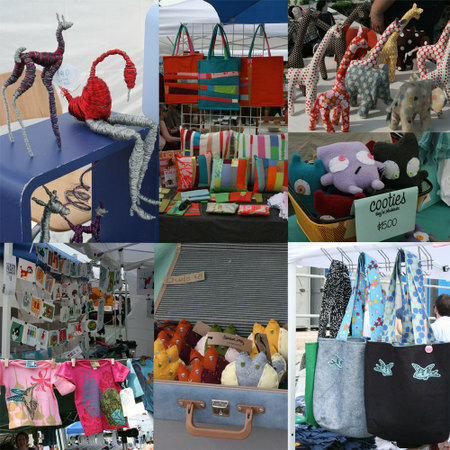 The most common items being sold were purses and bags, silkscreened t-shirts, letterpress notecards, and fuzzy stuffed monsters. There was also a smattering of jewelry, pottery, and funky animal sculptures. It was a very low key, chilled out atmosphere. People were surprisingly okay with us taking photos of their stuff. 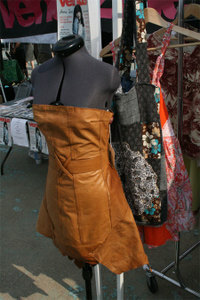 Though, one woman did confront me to ask who I was taking photos for (the photo I was taking was of the leather dress at left). She didn’t have a problem when I told her it was Craft Critique, but said, “Urban Outfitters screws us over, again and again.” To a certain extent, I’m not surprised. The treat of the Renegade Craft Fair is all the genius ideas; simple execution most of the time, but really clever concepts. No doubt this causes any number of thefts. It’s easy to take a photo and then reproduce the item from the photo. Icky. I have to say, even though I didn’t feel particularly motivated to buy (perhaps it was the heat, or the fact that I felt I could make most things being sold myself), I would definitely go back. And prices were reasonable enough that had it not been so miserable out, it’s very likely that I would have lingered at each booth and picked up some funky new treats. 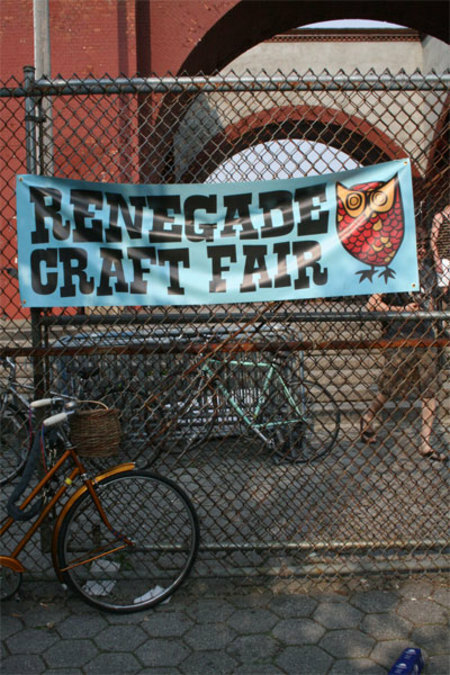 I encourage anyone in the Chicago or New York area to spend a day enjoying the fresh, funky, relaxed vibe of the Renegade Craft Fair. Caitlin Phillips of Rebound Designs: "A second chance for well-loved books." with her funky purses made from books. 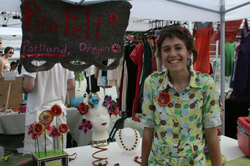 LeBrie Rich, the "Duchess of Felt" of Pen Felt with her "fabulous hand-felted wearables." 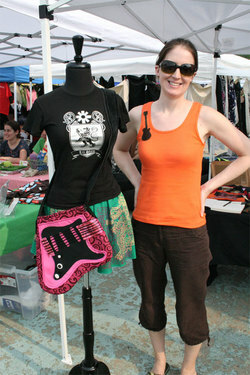 Liz Shaw's guitar bags from her rock line: "handmade handbags, one of a kind & small line." 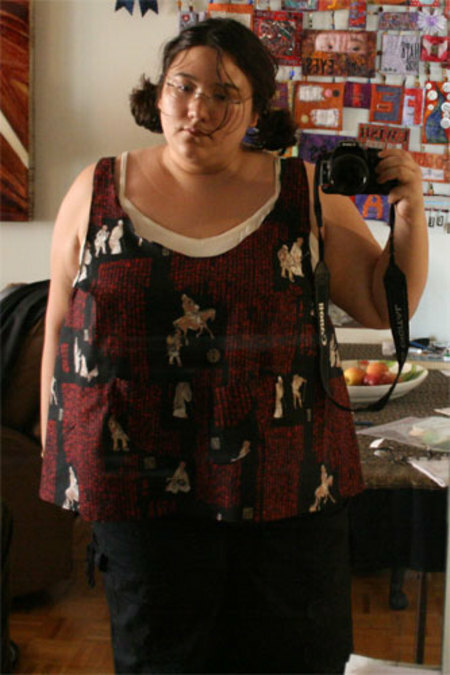 I wanted to let you know that Craft Critique is holding a contest with a big goodie giveaway! We're looking for celebration-related projects. All you have to do is e-mail a photo or scan to info@craftcritique.com. Also, new projects from the Altered Pencil Lines team are up! 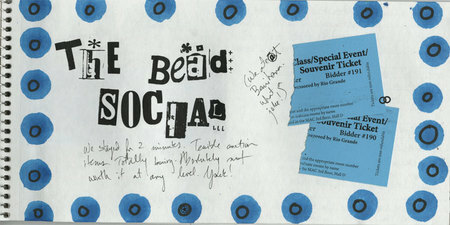 And, on Wednesday, an article I wrote on how to use a scrapbooking sketch to inspire altered items will appear. I hope you'll check it out! 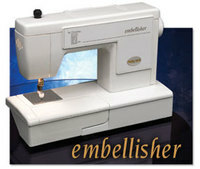 I just received my Embellisher by Baby Lock! I have been eagerly anticipating the arrival of this wonderful machine. It's a needle felting machine. 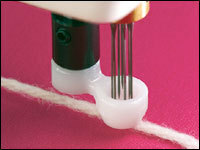 Basically, it looks like a sewing machine, but instead of a needle that you thread, it has a circle of seven barbed needles. There's no thread either. The seven needles just go up and down when you step on the pedal. 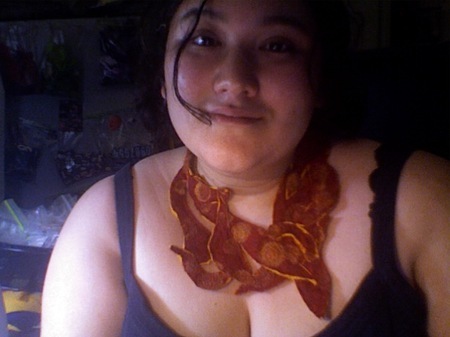 This is a completely reversible necklace. It's red with yellow dots on one side and yellow with red dots on the other side. 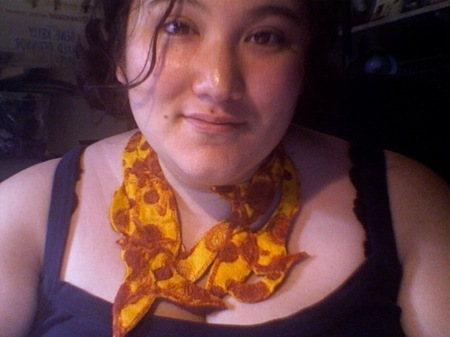 This is also reversible, but the colors are the same on both sides. Nevertheless, I had fun figuring it out! 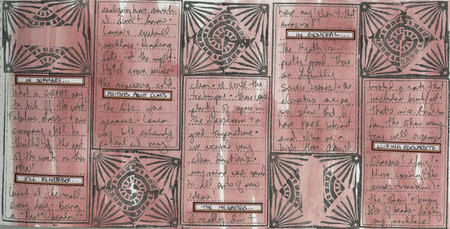 PS: The Maya Road Altered Tin in my JLMS DT post below, is featured on the Maya Road Blog! 1. Organize the way your brain works. I am a color person. I say, “I need something red.” Therefore, I have organized virtually everything by color. • Patterned Paper by color. • Small Embellishments by color. 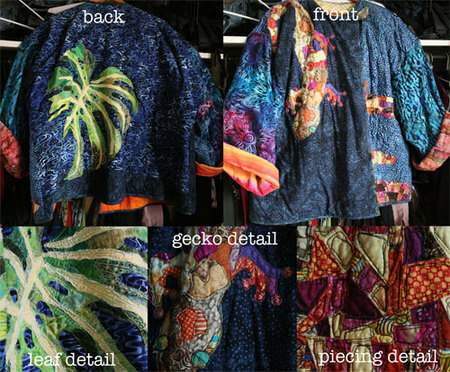 • Large Embellishments by color. Well, you get the picture. If you’re a theme person (“birthday”) then you probably want to organize your supplies that way. And, if you’re a brand person (“Basic Grey”) then you probably want to organize your supplies by manufacturer. 2. Create a situation where you can see what you have. • Clear storage. There are so many lovely boxes, bins, bags, jars, drawers, etc. that are clear and let you see just what you’ve got. • Out in the open. Where I can, I like to hang, stand, file, etc. my supplies out on top of surfaces (rather than hidden away). This is why I love shallow shelves! You can see everything. • Labels. I have been accused of over doing it with the labeling (I label my kitchen cabinets). However, labels are your best friend when it comes to organizing. Labels allow you to think once and then never again. 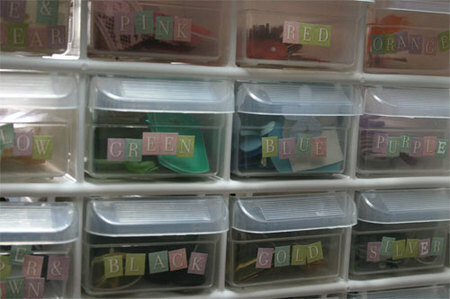 Once you organize your stuff (even into clear containers), stick a label on there: “flowers” or “blue” or whatever it is. Then you never have to think again. Just look for the label and you’ll know where it is or where it should go. 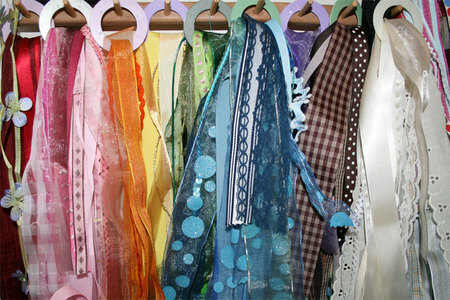 • Make or buy curtains to go across your shelving. Keep them open when you’re working and closed when you need to visually clean up. You know the old saying, “use it or lose it?” Having everything out in the open allows me to use it. I know what I have and I use it all! 3. Make it easy to put away. • Everything has a place. And, a place for everything. • Every storage container or space is clearly labeled. • I group like items into general bins or file folders (ex. 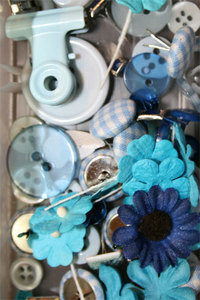 a drawer of blue stuff). • All my most used stuff is close at hand. I don’t have to get up to get it out or put it away. • I reserve the high shelves (i.e. the ones I need a ladder or a husband to reach) for stuff I don’t use very often. • I keep my most used supplies in a drawer at my desk separate from other like items. 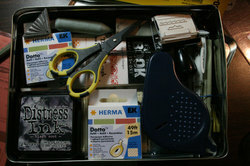 Example: I keep a favorite black ink pad, small acrylic block, and tiny alpha stamps in this drawer. My other ink pads, acrylic blocks, and stamps are kept elsewhere in the room. But since I use the black ink pad, small acrylic block, and tiny alpha stamps on a ton of stuff, it makes sense to keep them close at hand. And since I don’t have room right next to my desk for the rest of the ink pads, acrylic blocks, and stamps, it makes sense to separate them out. I cannot emphasize enough that everyone’s organizational needs and habits are different. But, these are three general rules that I believe will help anyone organize their stash, use their stash, and keep their stash organized.